I like nature. And I believe deeply in the importance of conserving our natural treasures. So several years ago, I established the Ricketts Conservation Foundation. The Foundation has pursued some exciting projects already, like helping to restore Wyoming’s Common Loon population. Building on the success of the loon project, the Ricketts Conservation Foundation has also turned our focus to another species that might otherwise fall through the cracks: the Trumpeter Swans in Yellowstone National Park. The Trumpeter Swan population there has been declining for the past 50 years, despite being protected. In 2012 the Wyoming Wetland Society, a small non-profit organization based in Jackson Hole, began releasing captive-raised birds in the park. The idea was to increase the number of breeding pairs in Yellowstone. But to ensure these birds didn’t remain susceptible to the challenges that small populations face, they needed to be connected with a larger, regional population. And the best way to do that is to connect the Yellowstone birds with other successful reintroduction programs in Montana, Idaho and Wyoming. So in 2018, the Ricketts Conservation Foundation and the Wyoming Wetland Society formed The Swan Project. Working with federal, state and tribal agencies, The Swan Project’s goal is to connect the existing restoration populations of Trumpeter Swans in these three states by 2028. 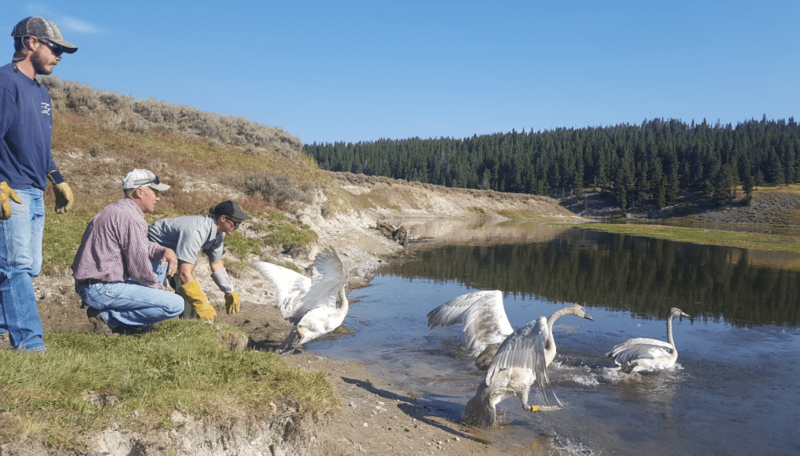 I’m excited about this project and believe it will help to ensure that Trumpeter Swans remain within the Greater Yellowstone Ecosystem for future generations to enjoy.